ORLANDO, Fla. (CBS/WKMG) The Occupational Safety and Health Administration cited SeaWorld Orlando for three safety violation in the death of killer whale trainer Dawn Brancheau. SeaWorld was fined $75,000 for the violations, one of which was classified as "willful." SeaWorld issued a press release today announcing it will contest the violations, reports CBS affiliate WKMG. "SeaWorld disagrees with the unfounded allegations made by OSHA today and have already informed the agency that we will contest this citation," SeaWorld said in its response. 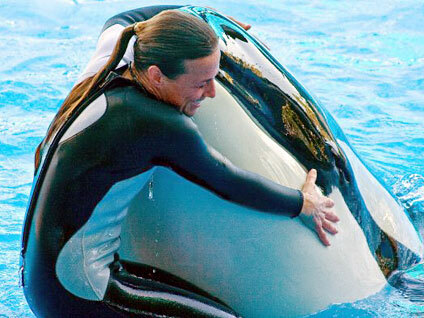 Brancheau was dragged into the water and killed by a killer whale named Tilikum in February. "SeaWorld trainers had an extensive history of unexpected and potentially dangerous incidents involving killer whales at its various facilities, including its location in Orlando. Despite this record, management failed to make meaningful changes to improve the safety of the work environment for its employees," OSHA said in a release. The agency proposes not allowing trainers to have any physical contact with Tilikum, the killer whale responsible for Brancheau's death, unless protected by a physical barrier. The OSHA report described Tilikum as having "known aggressive tendencies." The six-ton whale was one of three orcas blamed for killing a trainer in 1991 after the woman lost her balance and fell in the pool at Sealand of the Pacific near Victoria, British Columbia. Tilikum also was also involved in a 1999 death, when the body of a man who had sneaked by SeaWorld Orlando security was found draped over him. Sea World trainers were forbidden from getting in the water with Tilikum because of the previous deaths. But the killer whale still managed to grab Brancheau's long hair as she laid on her stomach on a cement clab in three inches of water. The cause of death was drowning and traumatic injuries. The OSHA report also suggests that trainers not work with other killer whales at the park, either in the water or out of water, unless they are protected by a barrier, deck or oxygen-supply system underwater. OSHA issued one willful violation to SeaWorld for exposing employees to drowning hazards while interacting with the whales. A willful violation means it was committed with "Plain indifference to or intentional disregard for employee safety and health," OSHA said. OSHA also issued SeaWorld a serious violation for exposing employees to a falling hazard for failing to install a stairway railing at the stage for the "Believe" show. An other-than-serious citation was issued for failing to equip outdoor electicle receptacles in Shamu Stadium with weatherproof enclosures. "OSHA's allegations in this citation are unsupported by any evidence or precedent and reflect a fundamental lack of understanding of the safety requirements associated with marine mammal care. Killer whales at SeaWorld are displayed under valid federal permits and under the supervision of two government agencies with directly applicable expertise: The U.S. Department of Agriculture Animal and Plant Health Inspection Service and the U.S. Department of Commerce National Marine Fisheries Service. SeaWorld is a member in good standing of the Association of Zoos and Aquariums and the Alliance of Marine Mammal Parks and Aquariums. Both associations make employee safety a central feature of rigorous accreditation processes," SeaWorld said in a news release. SeaWorld no longer allows trainers to go in the water with the whales. Complete Coverage of the SeaWorld Trainer's Death on Crimesider.